It seems to me that when I watched my mother sewing, she did not have dozens of needles, she had a package of 5 needles and I don't remember there being another package around. Now I have 4 different types of needles for my machine and occasionally need something that I don't have on hand. How did we get into this needle mess? Well, just like other things, the world is more complex than it was just 50 or more years ago. Just how does one decide on a good needle? Just what are the issues that one needs to know for the best results in embroidery? Just how do these needles make things better? 1. FABRIC When planning your project, consider fabric weight, thickness, weave type (woven or knit), weave density (close weave or loose weave) and composition (natural fiber, synthetic or a blend). 2. THREAD Embroiders mostly use a 40# weight thread for most designs. For a more detailed discussion of thread weight, check out this blog. Occasionally, you may have need for a 60# thread for use on details in a project that are small like eyes or floral seeds. 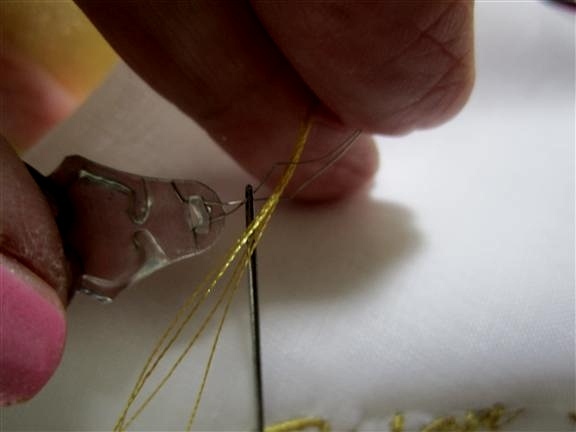 You will most likely be using a rayon, silk or polyester thread. Rayon and silk are appreciated for their sheen but polyester is closing up that gap very rapidly. For the information of the pros and cons of each thread type, check this blog. 3. 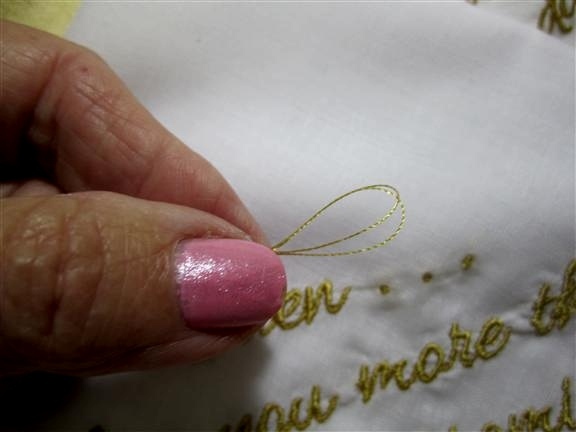 NEEDLE STYLE Embroidery work uses either an embroidery needle or a universal needle. I personally only use embroidery needles but I understand that Universal work fine as well. One word of caution, always use a ball point needle for knits. If you use a sharp, it will cut the thread which weakens the weave and subsequently will cause a 'run' or hole in your knits. 4. NEEDLE SIZE Most embroiderers use either a #11 or #12 needle. Embroidery needles are mostly size #12. However, if you are having problems with shredding thread, it can be a good idea to increase the size of the needle. The size refers to the width of the needle only, not the length or other designation. The Imperial size is the one used in the USA. 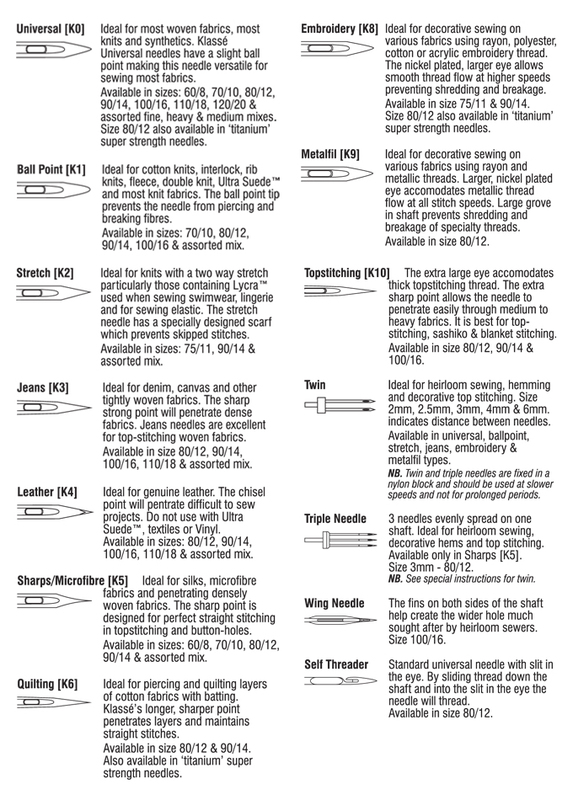 Below is the guide from Klasse Needles. All machine needles are stamped with the needle type and size. 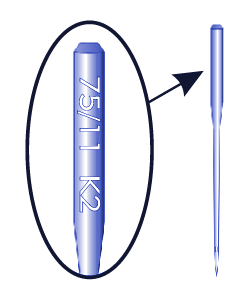 The needles are stamped on the curved side of the needle shank with metric and imperial sizes followed by relevant needle mark codes (K0, K1, K2, etc). This is the information on the Klasse Needle. Each needle brand has its own marking methods. Check the Internet for the brand you prefer. The above suggestions can be wrong for your project, it really depends upon too many factors to make a definitive decision. Additionally, what works for one person, may not work for you. But reviewing this information can help make a more beautiful embroidery project for which you can be proud. Using the right tools for the project is always the best idea. I really only use 2 needles, an embroidery and topstitch. I do have a pack of ball points and denium needles but don't remember the last time I used them. The one thing that I do is CHANGE the needle in the embroidery machine every 4TH bobbin. Needles take a beating embroidering and I will tell you right now rarely do I have anything pucker, break thread of do any of the other things you have listed. A new needle does wonders. I only use topstitch needles in the other machine, I do a lot of FMQ with invisiable thread and when using that thread you need a needle with a larger eye. I do change my needle more often than every 4th bobbin. But I think it is dependent on what you are doing as well as the wear. For instance, if you constantly do denim, your needle may need changing more often. I personally buy my needles by the 100 pack and they are very cheap, so I do change more often. I don't keep track of the use because I have a 15 needle machine. I am always surprised at how dull they are when I do change them. Since I mainly do small lettering on hankies, keeping a sharp needle is demanded by my type of work. I do wonder how others decide when to change their needle. How about you? Great article Pat! I've only changed my needle when starting to see a problem with thread shredding. I am rethinking that now! When we want our project to meet our expectations, it is a good idea to keep our tools sharp. A dull needle can be troublesome. Why take a chance on failure? Considering what you did to get prepared - a design - determining where to place the design - layout - stabilizer - a machine that you enjoy - et al - buy your needles in bulk and carefully toss them. Needles can harm animals as well as people. Needles needles needles.... they are sooo troublesome. I am making a quilt for my sister, which I started last Nov. We moved, my husband had medical issues, then I find out my tension wheels had started to rust.... aaaarrrrgggghhhh. Well, things have calmed down, I have continued the quilt..... and still.... problems. This quilt is a lot of strips, 6 colors that varies from dark to light to dark (5 shades), cut into 10 inch widths, then pieces to basket weave..... whew.... I have changed the needle a multitude of times. It still skips stitches. I am wondering if I have an entire batch of bad needles? I am using Universal 12, the fabric is cotton.... can anyone help?